This booming, up-tempo area anchored by bustling Polk Street is one of San Francisco’s original Seven Hills. It is located directly north of Nob Hill, south of North Beach, and is bordered by Cow Hollow and the Marina District. If you’re seeking views, get to climbing. 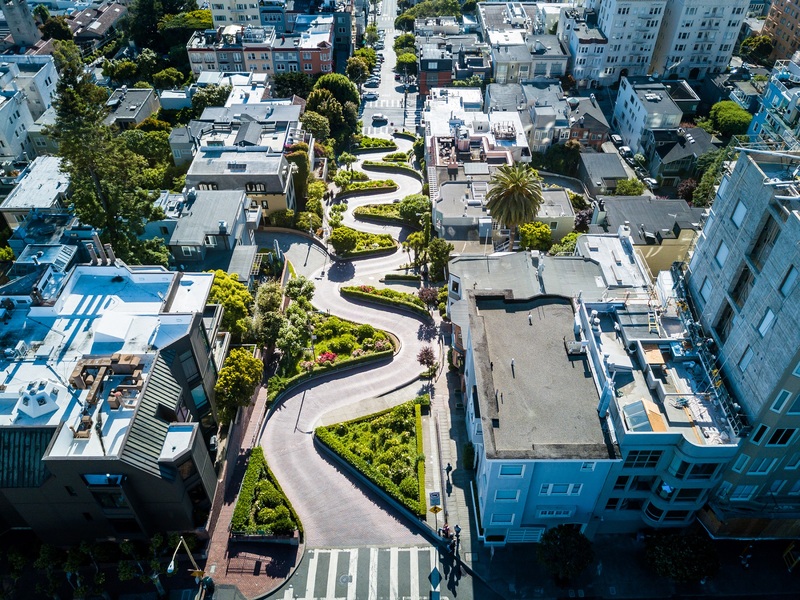 The world-famous Lombard Street and its many curves are located on Russian Hill, where you can see the Bay and Golden Gate Bridges, Marin County, and Alcatraz as just part of its vista. Russian Hill has streets that are so steep that pedestrian staircases are built into them – and, in fact, some streets are pedestrian-only as it is outright dangerous to have cars trying to climb such slopes. Scary stuff! In the 1970s, Russian Hill was the setting for Armistad Maupin’s Tales of the City, a fictionalized account of San Francisco. Later the cast of The Real World: San Francisco would stay at a home at 949 Lombard Street from February to June 1994. Just under 13,000 people live here, according to City-Data.com, making quite a dense population in an area that is not even 0.4 square miles. No wonder parking is so difficult. If you’re looking for the best apartments in Russian Hill, consider some of these luxury buildings: Crystal Tower Apartments, The Chestnut Street Apartments, and 1059 Union Street. Here you’ll find such fine amenities as professional on-site management, controlled resident access for security, incredible views (you’re on Russian Hill, after all), private balconies, and open, flowing floor plans. As a local real estate agent in Russian Hill, I can help you find your dream home in any of these communities. You don’t live in Russian Hill for the ease of parking or the low cost of entertainment. You live here because Russian Hill simply has everything – great transit options, every type of food you could imagine, and nightlife that will keep you hopping for weeks, months, and years. Some of the best restaurants on Russian Hill include the renowned Gary Danko, Fog Harbor Fish House, Stones Throw, Bolin Barbecue, The House, Betty Lou’s Seafood and Grill, Surisan, and Amarena. Coffee options include Royal Ground Coffee, Saint Frank Coffee, Café de Casa, Beacon Coffee and Pantry, Graffeo Coffee Roasting Company, and Fueling Station. A word about parking: it’s not for the faint of heart here unless your place comes with a designated spot. Public transit is excellent, as with most of San Francisco – but if you simply can’t give up your set of four wheels, I completely understand. Get in contact with me and we’ll find a way for you to not only get yourself the perfect home but a great home for your four-wheeled friend as well.